I had such a lovely day on Friday which was my last day at school. There was a special Leavers Assembly for me where the children took over and gave me a certificate for being such a lovely headteacher, they also gave me a large framed photograph of them all outside the school with drawings of themselves all round it. I received a gorgeous Bay tree and some chocolates from the governors and the staff bought me a bottle of bubbly and a stunning Pandora bead for my new bracelet. It has been such a pleasure working with the staff and children of this school and I am going to miss them dreadfully, but I have told them to expect me to pop in for a coffee sometime. Here are two of the cards I have made to send to say thank you. 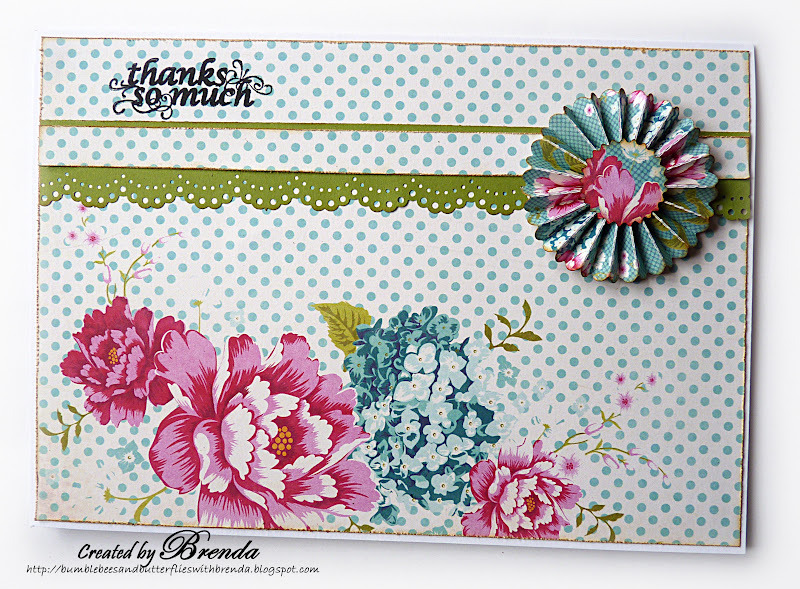 I have used the Tilda Sewingbird paper pad for both. Challenges to have some fun with. How lovely Brenda, they were so sweet to you , you were so highly thought of . What a wonderful position you held. Such fab presents, I bet there were some tears. Sounds like quite an emotional day - good luck going forward and your thank you cards you've made the school are fabulous. Yesterday sounds special, hope you enjoy every moment of every day, when you can now choose how to spend it. 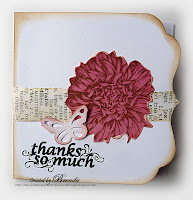 Love the cards you made, great rosette. 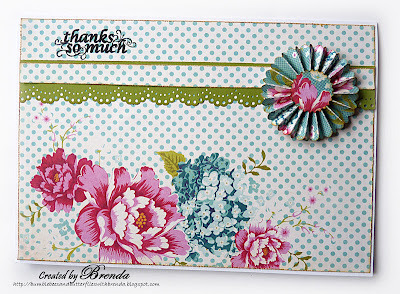 The Rosette on your first card connects with your PP beautifully, and I love the stamped sentiment up in that left corner. Your second card has a wonderful elegance, the flower looks wonderful taking centre stage. Aww'' Brenda I'm sure you had a tear or two on your leaving Assembly and such beautiful gifts to receive too. These cards are both gorgeous love this Tilda DP it's lush they are so pretty. Congrats onb your Retirement Brenda, now life can really begin! Two great cards, love the papers. ps. I love your two cards today! Lovely cards Brenda, it must be so hard to say good bye.